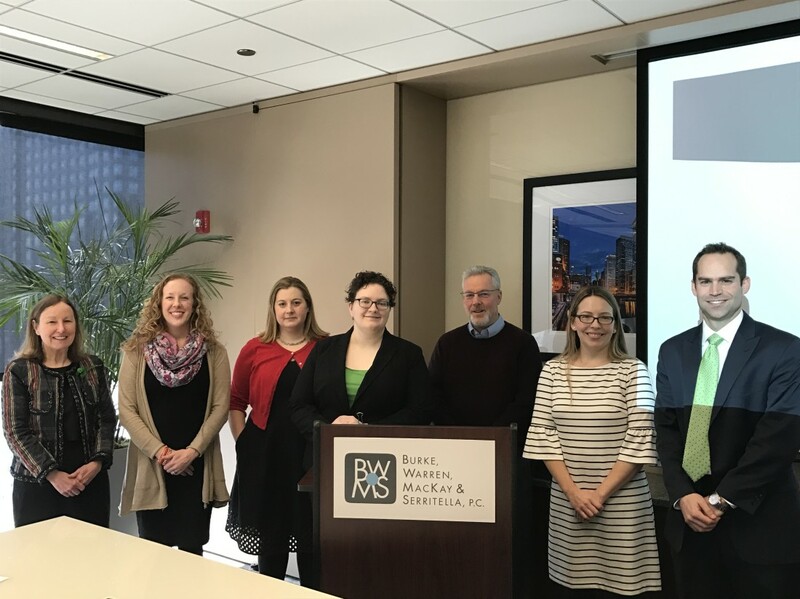 (From left) Pat Carlson, Tiffany Sorge Smith, Shana Shifrin, Ginger Devaney of the Domestic Violence Legal Clinic, Robert Glaves of the Chicago Bar Foundation, Ryanne Easley of the Chicago Bar Foundation and Alex Marks at the Firm’s Investing In Justice Campaign kickoff on March 10. The attorneys at Burke, Warren, MacKay & Serritella are honored to participate in the Chicago Bar Foundation’s 11th Annual Investing in Justice Campaign. The Chicago Bar Foundation, charitable arm of the Chicago Bar Association, aims to make the legal system more fair and efficient for everyone through pro bono and legal organizations that are funded largely by the Investing In Justice Campaign. Those receiving services thanks to the Campaign include the elderly, disabled individuals, veterans, children, domestic violence victims, people at risk of wrongfully losing their homes, immigrants fleeing persecution and abuse, and many others in the Chicago area in need of legal assistance. Burke, Warren has been a consistent leader in this campaign and this year the Firm had over 90% attorney participation and raised tens of thousands of dollars. This year’s internal Investing In Justice Campaign kicked off on March 10 as the Firm hosted Bob Glaves, President of the Chicago Bar Foundation, along with Ginger Devaney, staff attorney at the Domestic Violence Legal Clinic, for a discussion on immigration law and the intersection between immigration law and domestic violence. Ginger also touched on current changes to immigration law and how those changes are impacting access to justice. The Campaign has grown to include 150 firms and more than 5,000 individual attorneys throughout greater Chicago and is the largest campaign of its type in the country. This year’s Campaign grants will serve more than 30 pro bono and legal aid organizations thanks to a number of generous matching contributions from participating firms and companies, including Burke, Warren, and with the additional foundation and government funding the CBF is able to leverage through the Campaign grants process. Thank you to Alex Marks, Jeff Warren and Firm management for their continued support and donation matching, the Pro Bono Committee for its efforts, and most importantly to all of the attorneys who participated!